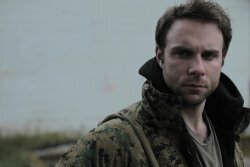 Just back from combat, a young U.S. Marine veteran - burdened by the physical and emotional scars of war - faces a new battle to find purpose in the mundane existence of civilian life during a time of national economic strife. His escape to the solitude of nature gives Justin refuge from the pressures he faces yet is torn between the desire to escape and the fear of being homeless and alone. Geoff Ryan's previous narrative work includes writing and directing the short films Pour and Cult of Eden. He has also directed the Ocean2ocean webisode series (26 episodes) for Nautica, national television commercials, and music videos that have aired on MTV2 and internationally. Fray is Geoff's first feature film. Director Geoff Ryan and lead actor Bryan Kaplan will be available for a Q&A after the screening.